Although it’s one of Tom Roberts’ most important studio paintings of the period, his 1889 work Jealousy has rarely been seen due to its poor condition. A new conservation project is underway to change that. Roberts is often called the father of Australian landscape painting, but his practice in the 1880s was, in fact, multi-faceted, consisting mainly of studio work as well as his now more familiar outdoor paintings. 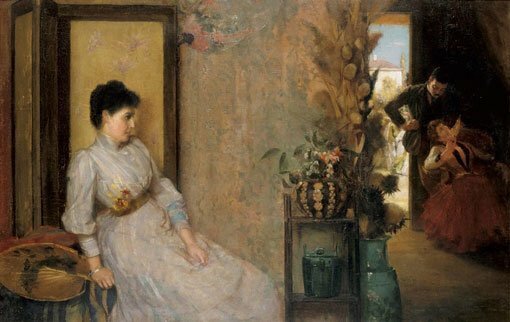 He painted Jealousy after his return to Melbourne from Europe, where he’d been studying and painting from 1881 to 1885. It was first exhibited at the Victorian Artists Society’s exhibition in May 1889 with a title taken from a line in Shakespeare’s Othello : One not easily jealous, but being wrought, perplexed in the extreme . Roberts clearly considered the work as one of his more ambitious to date, pricing it at £100. However, Jealousy did not sell at the exhibition. Instead, it was bought by Mrs Elizabeth Adeline Nasmyth of Geelong the following year at the Gemmell, Tuckett and Co auction, where it was presented under its current title. The work remained in her family until it was offered to the Art Gallery of NSW, which bought it in 1960. Although it was in poor condition, it was recognised as a major museum piece. 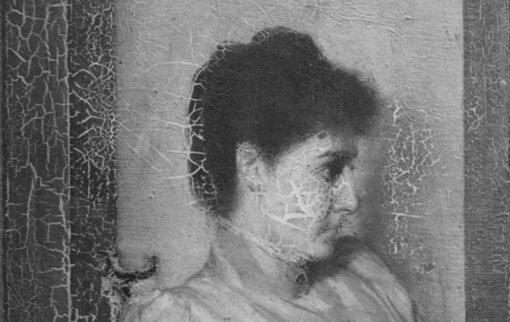 It’s easy to see the extensive drying cracks on the painting’s surface in a photograph taken when the work was acquired (detail above). Some time after, the work had been broadly painted over by a restorer – in a method not used by conservators today – further disrupting the original composition. The damage and subsequent retouching of the woman’s face is particularly poor in both texture and colour. Paint losses have been left throughout, and the varnish has yellowed and darkened. Now, the Gallery’s Conservation Benefactors Fund is providing for a major conservation treatment of Jealousy , which will take several months. We’ll use x-radiography, infrared and x-ray fluorescence to examine the extent of the damage and determine the cause. We’ll then plan the treatment in more detail, which will include removing discoloured varnish and previous restorations, filling paint losses, retouching areas of loss, and applying a final varnish. If you would like help, you can make a tax-deductible donation of any size towards the project – just note on your donation form that you’d like to contribute to the Conservation Benefactors Fund. Or you can form an ongoing relationship by joining Friends of Conservation through the Gallery’s Foundation.